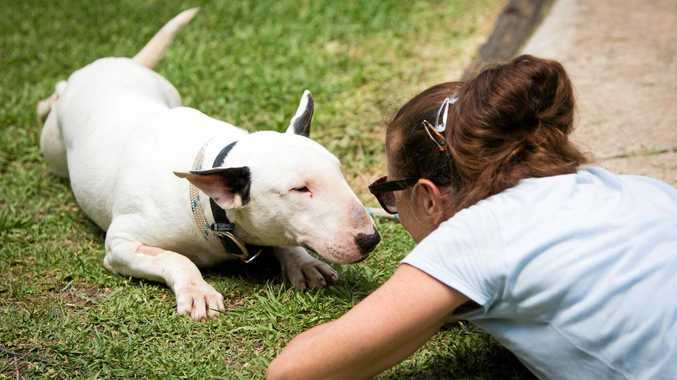 SOME of the bull terriers seized in a puppy farm raid last week are now up for adoption. Last Wednesday, RSPCA inspectors were called to a property north-west of Gladstone regarding a complaint about five dogs, but instead found 110 pure bred dogs kept in small cages and in confined spaces. RSPCA Queensland chief inspector Daniel Young said their conditions were appalling. At the end, 102 dogs were seized and surrendered to the RSPCA, with the consent of the owner. Eight of the dogs were owned by other people, and were not surrendered. The RSPCA sent convoys to move the dogs to shelters in Bundaberg, Rockhampton and south-east Queensland - 19 were transported to RSPCA Noosa. According to a post on Facebook, the Noosa shelter couldn't move the dogs normally because they never had experience walking on leads. "Trolley Uber came in to play," the post said. "All our little friends are now clean, fed, and living in comfort. "Our touch and love will show them the world is great, fun and not scary." Noosa shelter manager Nicole Cleary said the dogs were initially shy and reserved when they entered the shelter. "They were corner orientated," Ms Cleary said. "Having been in the crate situation, too much space can be a bit of a profound fright for them." However, within a short time, their personalities started to shine. "In 3-4 days, the change in the dogs was profound," Ms Cleary said. "They started to do play bowing, and they were starting to be really free in their movement, and just happy dogs. "They are social, they're friendly-natured dogs, and that's been evident in all the dogs from the first load we got." The RSPCA announced adult dogs will be up for adoption for $500 and the young puppies for $1,500, justifying the high price due to their 'significant demand'. "The fee paid on this animal will directly help subsidise the thousands of animals who come through our care each and every year that are 'less desirable'," they said. They have also set the prices to prevent on selling of the pups for an even higher price. All funds will go back directly to the RSPCA's efforts, and adoption details are on their website.